Not too many people know this about me but I am a huge Lover of Beer. I am what you would call a BEER CONNOISSEUR. I have my favorite brands like “BROOKLYN BREWERY” which is brewed in the Williamsburg section of my hometown City of Brooklyn. STELLA ARTOIS, which is my bestie, Tanya’s, favorite brand as well. And because I am also a fan of IPA’s (India Pale Ale) one of my favorite brands to drink is GOOSE ISLAND. 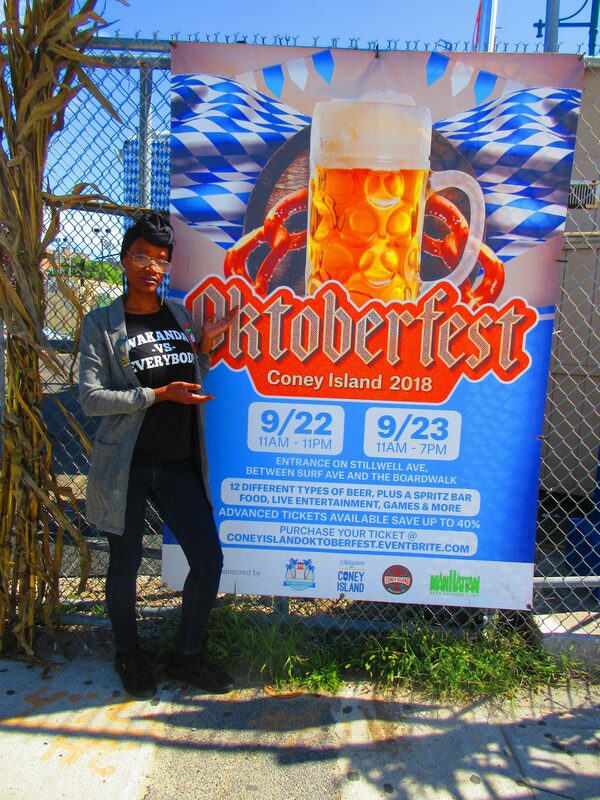 Lucky for me, Tanya loves me so much that she treated me to CONEY ISLAND’s 1st Annual OKTOBERFEST. 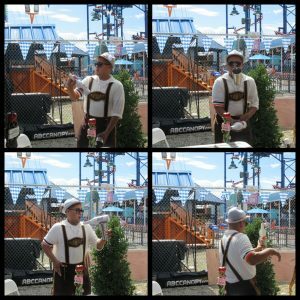 This First Annual Coney Island Oktoberfest was an outdoor, 2-day event. We chose to attend on Saturday (9/22/18) which was the 1st day of the Festivities. I met up with her in our old neighborhood, Sheepshead Bay (Brooklyn) and we took the B36 bus. 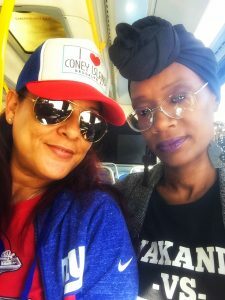 Although we could have taken it straight there, we wanted to get there faster than the bus would allow so we got off on Sheepshead Bay Road then hopped on the Q-train to Stillwell Ave which is the last stop. Tanya had paid in advance for our tickets. 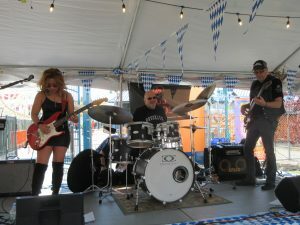 She purchased the $40 tickets which included Admission, plus Full Tasting of (12) 9 ounces of various beers. As we entered, we were given something for our wrist to show our ticket status, basically VIP. 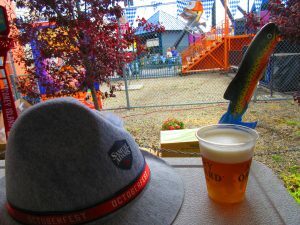 We also received a cool brim, Sam Adams hat and wrist sweatband. We couldn’t wait to indulge. As we enjoyed their sounds, we got something to eat in order to coat our stomach for the drinks we would take in. 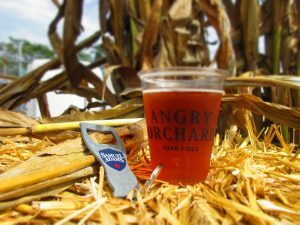 When we got our meal, we started with a cup of ANGRY ORCHARD. 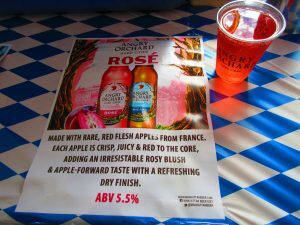 While Tanya went with the CRISP APPLE HARD CIDER, I went with the ROSE because it had more of an Apple flavored taste. 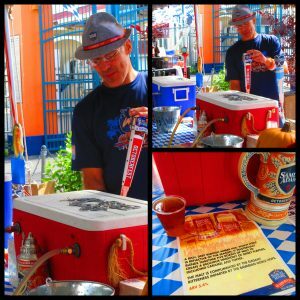 What would this event be without tasting SAM ADAMS OCTOBERFEST style beer on draft, described as “A rich, deep reddish hue.” Made with 5 blends of roasted malt to create a delicious sweet flavored taste which includes caramel & toffee. 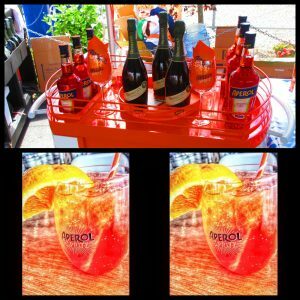 It was time to switch it up a bit so we tried an APEROL SPRITZ cocktail. This is basically a drink made with Prosecco & Soda Water, garnished with Orange slice. You can make this at home by putting ingredients together or it can be purchased “ready-To-Drink.” Either way, the taste was amazing. We enjoyed 2 each. Next up, I wanted to try another IPA so I went with the FISHEYE. This beer had a dry-hop with a floral, citrus taste. I liked it as well but not as much as the Merman IPA I mentioned earlier. 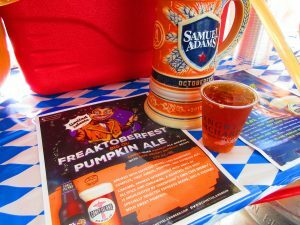 The last beer we tried for the 1st time was also from Coney Island Brewing Co., called FREAKTOBERFEST PUMPKIN ALE. Its described as, “a hauntingly complex, copper-hued, pumpkin and espresso ale. Caramel aromas intermingle with hints of allspice and cinnamon. A roasted, rich body is highlighted by Café Grumpy’s specially selected espresso beans and is finished with sweet pumpkin.” This was one of my favorites out of them all. I had about 3 of them. We indulged in a few more beers from earlier, but overall I loved the beers which were brewed in Brooklyn. CONEY ISLAND BREWING CO., hands down had the best selections and best tasting. If you’re ever in Brooklyn, check them out. They are located at 1904 Surf Ave. Opened Thurs-Sun. Call for business hours 800-482-9197. Needless to say, by the time we were ready to leave I was buzzed to my capacity. I wasn’t twisted but I was tipsy enough to know I wasn’t going to make it back to Queens in my current state so I went back to Tanya’s house til it wore off,,, The next morning, lmao *Shrug* *Judge Me if you Must* I had a great time as I always do when she and I link up. 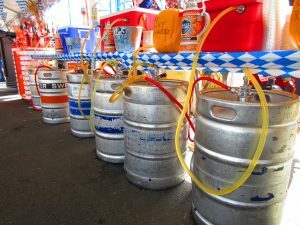 Cant wait for the next Beer event. I had a great time with you as I always do when we venture out. can’t wait for the next venture. love you Bestie. 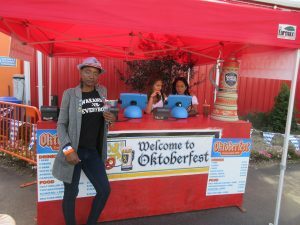 OMG Bestie, The Octoberfest and the Pumpkin beer was dddddd’lish! Thank u for always supporting me!